Trees and other plants, from towering redwoods to diminutive daisies, are nature's hydraulic pumps. They are constantly pulling water up from their roots to the topmost leaves, and pumping sugars produced by their leaves back down to the roots. This constant stream of nutrients is shuttled through a system of tissues called xylem and phloem, which are packed together in woody, parallel conduits. 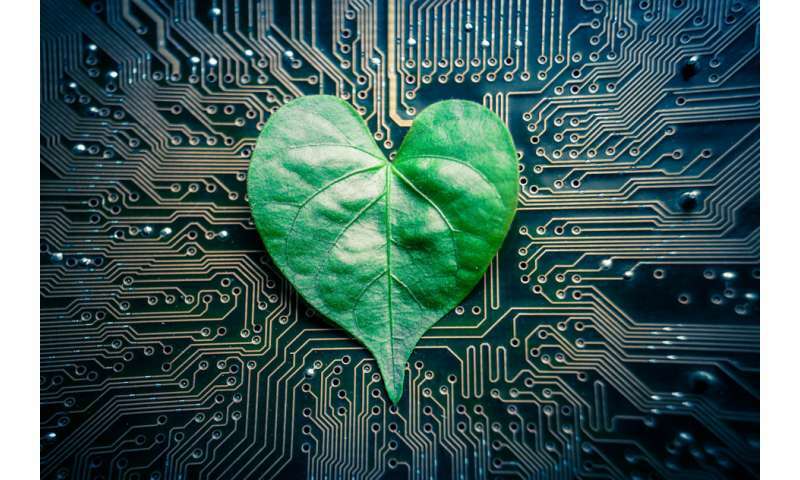 Now engineers at MIT and their collaborators have designed a microfluidic device they call a "tree-on-a-chip," which mimics the pumping mechanism of trees and plants. Like its natural counterparts, the chip operates passively, requiring no moving parts or external pumps. It is able to pump water and sugars through the chip at a steady flow rate for several days. The results are published this week in Nature Plants. Anette "Peko" Hosoi, professor and associate department head for operations in MIT's Department of Mechanical Engineering, says the chip's passive pumping may be leveraged as a simple hydraulic actuator for small robots. Engineers have found it difficult and expensive to make tiny, movable parts and pumps to power complex movements in small robots. The team's new pumping mechanism may enable robots whose motions are propelled by inexpensive, sugar-powered pumps. "The goal of this work is cheap complexity, like one sees in nature," Hosoi says. "It's easy to add another leaf or xylem channel in a tree. In small robotics, everything is hard, from manufacturing, to integration, to actuation. If we could make the building blocks that enable cheap complexity, that would be super exciting. I think these [microfluidic pumps] are a step in that direction." Hosoi's co-authors on the paper are lead author Jean Comtet, a former graduate student in MIT's Department of Mechanical Engineering; Kaare Jensen of the Technical University of Denmark; and Robert Turgeon and Abraham Stroock, both of Cornell University. The group's tree-inspired work grew out of a project on hydraulic robots powered by pumping fluids. Hosoi was interested in designing hydraulic robots at the small scale, that could perform actions similar to much bigger robots like Boston Dynamic's Big Dog, a four-legged, Saint Bernard-sized robot that runs and jumps over rough terrain, powered by hydraulic actuators. "For small systems, it's often expensive to manufacture tiny moving pieces," Hosoi says. "So we thought, 'What if we could make a small-scale hydraulic system that could generate large pressures, with no moving parts?' And then we asked, 'Does anything do this in nature?' It turns out that trees do." The general understanding among biologists has been that water, propelled by surface tension, travels up a tree's channels of xylem, then diffuses through a semipermeable membrane and down into channels of phloem that contain sugar and other nutrients. The more sugar there is in the phloem, the more water flows from xylem to phloem to balance out the sugar-to-water gradient, in a passive process known as osmosis. The resulting water flow flushes nutrients down to the roots. Trees and plants are thought to maintain this pumping process as more water is drawn up from their roots. "This simple model of xylem and phloem has been well-known for decades," Hosoi says. "From a qualitative point of view, this makes sense. But when you actually run the numbers, you realize this simple model does not allow for steady flow." In fact, engineers have previously attempted to design tree-inspired microfluidic pumps, fabricating parts that mimic xylem and phloem. But they found that these designs quickly stopped pumping within minutes. It was Hosoi's student Comtet who identified a third essential part to a tree's pumping system: its leaves, which produce sugars through photosynthesis. Comtet's model includes this additional source of sugars that diffuse from the leaves into a plant's phloem, increasing the sugar-to-water gradient, which in turn maintains a constant osmotic pressure, circulating water and nutrients continuously throughout a tree. With Comtet's hypothesis in mind, Hosoi and her team designed their tree-on-a-chip, a microfluidic pump that mimics a tree's xylem, phloem, and most importantly, its sugar-producing leaves. To make the chip, the researchers sandwiched together two plastic slides, through which they drilled small channels to represent xylem and phloem. They filled the xylem channel with water, and the phloem channel with water and sugar, then separated the two slides with a semipermeable material to mimic the membrane between xylem and phloem. They placed another membrane over the slide containing the phloem channel, and set a sugar cube on top to represent the additional source of sugar diffusing from a tree's leaves into the phloem. They hooked the chip up to a tube, which fed water from a tank into the chip. With this simple setup, the chip was able to passively pump water from the tank through the chip and out into a beaker, at a constant flow rate for several days, as opposed to previous designs that only pumped for several minutes. "As soon as we put this sugar source in, we had it running for days at a steady state," Hosoi says. "That's exactly what we need. We want a device we can actually put in a robot." Hosoi envisions that the tree-on-a-chip pump may be built into a small robot to produce hydraulically powered motions, without requiring active pumps or parts. "If you design your robot in a smart way, you could absolutely stick a sugar cube on it and let it go," Hosoi says.